This is self catering with a difference!! Llys Bilidowcar is a luxurious marina-style house with wonderful sea views from the balcony. Only a 2 minute walk to the beach & coastal path. The house has a WTB 5 STAR grading which is the highest accolade for quality, service, ambiance and facilities. Sleeps up to 4 people plus a baby in a cot in two bedrooms. Llys Bilidowcar is perfect for couples, families or just on your own. The Ground Floor Lounge has French Doors opening into the safe, enclosed garden which has decking and garden table and chairs. It is furnished with two comfortable settees, and has a wide screen TV, DVD and video. There is a selection of videos, games, some toys. and a big box of Duplo. The First Floor Lounge has French Doors opening out to a terrace with seating area and sea views. Furnishing includes a comfortable leather three-piece suite with reclining chair, wide screen TV, Sky,video and DVD. The Kitchen/Diner is equipped to the highest standard with built in fridge/freezer, washer/dryer, dishwasher, ceramic hob-oven and microwave. Bedroom 1 has a double bed with double duvet and pillows on a comfortable interior sprung mattress. The beds will be made up ready for your arrival. This bedroom has an en-suite shower and toilet. Television/DVD. Clock/radio alarm. Bedroom 2 comprises of two single beds with duvets and pillows. Each bedroom has an independent convector heater. The Bathroom has a bath with independent shower over the bath, mirror and shaving point. Wall mounted fan heater and extractor fan, hairdryer and bathmats. Heating is all electric, using Economy 7 and convector heaters. The house is well insulated and remains warm and cosy all year round. There is private off road parking for two cars. Our prices are all inclusive and reflect the high standard of our accommodation. We provide clean fresh bed linen, towels, electricity and heating also many of the basics you require for your holiday such as washing up liquid, dishwasher powder, toilet roll, salt, pepper, tea, coffee, sugar etc and a pint of milk for you to have a cup of tea after your journey before unpacking! If you need anything else just let us know and we may be able to arrange it for you. Internet access is available free of charge in The Castle in Little Haven and for a small charge in the Atlantic Hotel Broad Haven (2 minutes walk). Llys Bilidowcar is a Baby and Child Friendly establishment, we can provide you with a cot, highchair, stairgate, bed guard, baby bath, top and tail bowl, monitor, sterilizer, blender, plastic cups, bowls, plates, spoons, beakers and cutlery, child toilet seat, toilet step and all the electric sockets are covered. There are also buckets & spades and nets ready for the beach! There is also a selection of toys, books and videos all provided free of charge! It is our intention to offer the discerning visitor the very best service, and aim to make your holiday as enjoyable and memorable as possible. We can arrange a number of additional services should you require, including flowers, chocolates, champagne or a celebratory cake for a birthday, anniversary, special event or just to make your stay extra special. It would be a pleasure to help with any special request. The property is immaculately clean and we pride ourselves on our high of comfort. Luxury 5* Sea views. 2 min walk from beach & coastal path. Very child friendly - see our website. Apologies we operate a no smoking policy but you would be welcome to smoke outside. 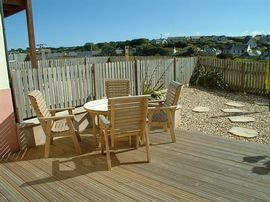 Safe enclosed garden with decking and garden table & chairs. Local Services: Londis mini market in village. 24 Hr Tesco in Haverfordwest (6 miles). Take the B4341 from Haverfordwest to Broad Haven and proceed for about 6 miles. On entering Broadhaven, approached off B4341. Turn left into Puffin Way. The house is clearly marked Llys Bilidowcar. £150.00 - £750.00 (peak season). Weekend and short breaks welcome out of season. Please see our website for on line booking. We welcome guests all year. Please see our website link for availability and on line booking. "An immaculate house well deserving of the rating. Perfect location for coastal walks, the beach and the Puffin shuttle. We've had a most enjoyable week and we loved the Welsh cakes! Thank you." Andrews family. "The only problem is - there is nothing to complain about - the house is perfect and I leave without being able to complain and I like to complain!!!!" The Greensitts. "A wonderful Christmas present from our son and a desperately needed respite break. We feel really refreshed after staying in this immaculate house set in such a peaceful location. The icing on the cake was a lovely day trip to Skomer to see the Puffins - a must for anyone who enjoys walking, photography or bird watching." The Temples Newport. "Great accommodation, stylish and tasteful, maintained at a high standard. Very thoughtful provision of everything necessary making our stay comfortable and enjoyable. We very much appreciated the Welsh cakes etc - thank you very much." The Macsorley and Rundells. "Delightful accommodation - fully deserving of the 5 star rating. Very enjoyable and relaxing break. We look forward to visiting again." Tayler family Leeds. "What a fantastic place to spend our first holiday in as a family. The house is equipped for everything -great when you have a baby. The weather has been lovely and with the beach so close we have been every day. A return trip won't be far away. Thank you." Crisp family Wiltshire. "We loved the house with the balcony and garden. Lovely family holiday and the house including all the baby equipment meant it was stress free. Thank you." Lucy, Anthony, Phoebe and Ava Llanelli. Finalist in Wales Tourist Board awards for Bsrt Place to Stay (self catering).